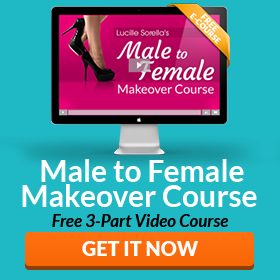 Makeup plays a big part in your feminine transformation. That means having a well-stocked makeup kit is a must! 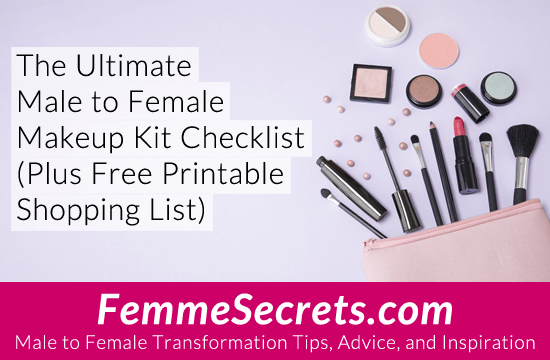 Since I’m often asked about what makeup to buy – and since it’s easy to blow your budget on one Sephora shopping trip – I’ve put together a checklist outlining the must-have items for your collection. I also created a downloadable shopping list that you can print out and take to the store with you. Download it here! If you’re going to splurge on one thing, it should be a good set of makeup brushes. You’d be amazed how much better your makeup looks when you use proper brushes vs. those tiny applicators that come with your makeup. While this list might look long, the good news is that you DON’T have to go out and spend a bunch of money on expensive cosmetics. In fact, you probably already have most of what you need. And what you don’t have, you can find inexpensively in any drugstore. The great thing about makeup is that no matter what your skill level, there are always new techniques to try and colors to play with. And as Coco Chanel said, on a bad day, there is always lipstick! What are you favorite must-have makeup essentials? Do you do most of your shopping in drugstores or are you a Sephora-kinda gal? P.S. While the right tools are essential, good makeup is all about technique. Learn how to master your makeup skills with a pro makeup artist Chris Scott in Makeup Magic: The Ultimate Male to Female Makeup Program. I think your make up routine should take no longer than 10 minutes…..otherwise waisting precious time….that could be spent doing other stuff. Hi Jessica – I go out daily, but it still takes me about 20 minutes or greater to get my makeup done right. I don’t use a lot, just enough to make me blend in as any other woman you would see out in the mall. Here I am the other day. What do you think? You should just grow your hair out and get away from wigs. A wig can ruin a look if not properly done up. Otherwise your make up is fine. I started my transition at age 30. I can pass with little to no make-up on…I only wear it, when go somewhere nice, or to a party/event…otherwise without. Pic above is without. Using makeup apps to try before you buy on your photos of your face is a wonderful tool. These apps give you an opportunity to try on a huge selection of products in various shades and application styles. This gives you an idea of what you can achieve with your looks. Appears you were a good student! You look amazing and flawless. Always fun to get all done up and go out and about. I have a makeup regimen every day after bathing. It takes me about 1/2 hour. But the final touch is applying my lipstick. I wouldn’t think about going out without my lipstick, even if I am just staying home doing chores around the house. Lipstick says “I am woman”…don’t doubt me ! This week’s blog is an invaluable run-down on make-up essentials. The tips are quite simply AWESOME. I normally buy my make up from my Superdrug store. Some great basics and some great comments! I just want to throw in my two cents with a recommendation. As Lucille stated, you don’t have to go broke to get quality brushes. I recommend the white handled Wet & Wild brushes that you can find at any drugstore (and some at Dollar Tree!) They are very good quality and quite durable. I’ve given several sets of these brushes away as gifts and promotions to my makeup clients, and to a one, they have all liked them. YOU are an expert and it SHOWS…fabulous Smile as well. @Dr. T.J. Thank you so much! That picture was taken for a formal dance I attended in January… here’s another shot.